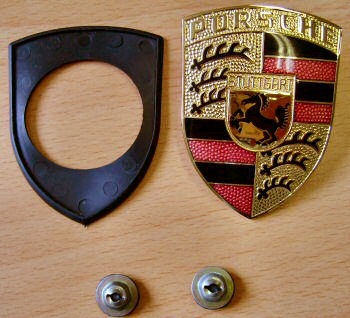 Original and genuine Porsche Bonnet Badge Kits for all Porsche models to 1994. Suitable to replace faded or missing badges. Easy fitment with all fittings supplied. NOTE: Can be fitted to all Porsche models up to and including the 1994 model years. Simple installation - no special tools or knowledge required. Original and genuine Porsche Bonnet Badge kits are ideal for replacing missing badges or ones that have faded and lost their showroom look. Great value and easy to fit to your Porsche with no special tools required.